Clean Energy is a Good Business Strategy and Businesses in Santa Clarita are turning to Solar Energy to power their store fronts. Join the movement and show your Customers that you care about our Planet. In the process, your company can be savings hundreds of dollars a month on Electric costs. We meet with the Business Owner / Decision Maker of the Company to discuss Wants, Needs, and Options with Solar Energy. After a few measurements, we will provide you a detailed, and itemized, Estimate of all costs associated with the Conversion to Solar Power. *Keep in mind, our Estimates are always Free, with No Obligation attached. Once the business has decided to proceed and options have been agreed upon, Santa Clarita Solar Installation will begin the preparation and design of your Photovoltaic Solar Collectors. You will have a say in where you would like the Solar Panels placed. We will do a thorough analysis and determine where the sun is present the longest during the day. Many Businesses not only house Photovoltaic Solar Panels on the roof of their buildings, but atop Parking Garages, Parking Lot Covers, Balconies, as well as on the ground in open area. A secluded area on your Businesses Property will be dedicated to housing your Inverter and Battery. 1. Your Business will Reduce Operating Costs. No matter if you are a large or small Business, Solar Energy will lower, and in some cases, remove your Electric Bill. 2. Businesses Get Good Returns on Investments. Public Agencies and Businesses have seen Governmental Incentives when converting to Solar Energy. Solar Power Investments being long-term savings as well as quick paybacks. 3. Solar Power is Maintenance Free and Reliable. Our Systems at Santa Clarita Solar Installation will require little to no maintenance depending on the system you chose. Our systems provide renewable electricity quietly and cleanly for 25 to 40 years. 4. 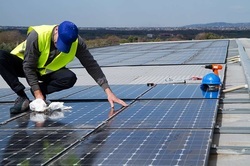 Solar Businesses can earn the "Green" Label. Any Business utilizing Renewable and Clean Solar Energy can express their participation in the battle against Global Warming. Going Green doesn't only help reduce operating costs, but is great PR for any company.